Our MoMa tour guide, Grace, took us through the Museum. It was Tuesday, which is the day MoMA is closed to the public. It was so great to see the amazing art without crowds. Grace took us to the gallery to see Van Gogh’s Starry Night. It was truly breathtaking. We saw Andy Warhol’s Gold Marilyn Monroe, Picasso’s Girl in the Mirror and the beautiful sculpture Unique Forms of Continuity and Space by Umberto Boccioni. 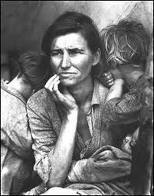 The most moving exhibit for me yesterday was Dorothea Lange’s photographs of the Great Depression. We focused on Migrant Mother. Grace asked the children to comment on it and share their observations. They noted her pained look into the distance, they noted the determination in her expression, they noted the children on either side of her. I was proud that Chloe noticed the baby in her lap – it is not so obvious. I noticed the baby looked full faced, well fed. I asked Chloe if she knew why the bay looked healthy when the others looked thin. She rolled her eyes and let out a sigh and said, “because she nurses him.” Grace looked over at us. I shared my observation of the full faced baby and Grace commented, “well, yes, the mother is determined to get her children fed.” I said, “the baby is clearly breastfed.” Grace looked at me askance. I smiled. We moved on. I was so moved by the exhibit and this photograph. 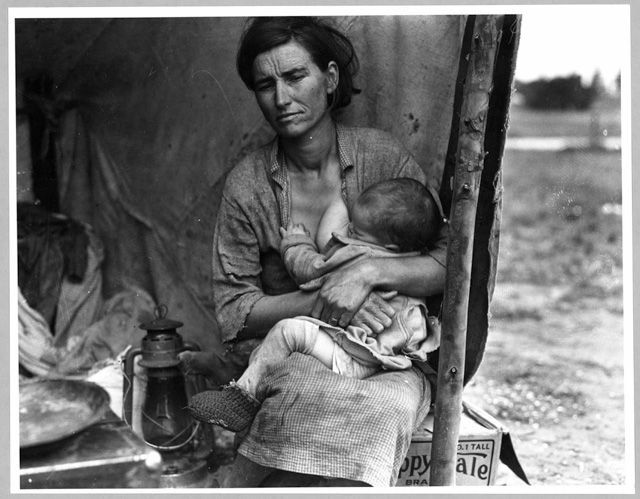 I went home and googled Dorothea Lange and Migrant Mother. The Migrant Mother is Florence Owens Thompson. I will not get into the controversy surrounding the photos of Mrs. Thompson but I did find that Dorothea Lange took a few other images of her. There is a beautiful image of her nursing the baby. We’re going to the MOMA on Friday (as long as it doesn’t pour buckets!). I will check her out. You will be in NYC? For how long? Went with T and kids to Ash Wednesday service yesterday (Hunter & Sage served). Lots of babies at noon Mass and unfortunately lots of bottles but not Matthew – seemed he nursed continually.